With a colour range of over 40 shades Robin double knitting is the premier 100% quality acrylic range. The colour palette also includes timeless classics, a colourful marl collection as well as the latest fashion colours. This is the UK's favourite soft, fleecy yarn that comes in purest white, cream and trendy baby colours. Available in 25g balls, it is more economical for you to use several of these delightfully sunny colours in one knit, as you can buy more accurate amounts of yarn with less left over. Knitters Gauge, a useful addition to any knitter's equipment. 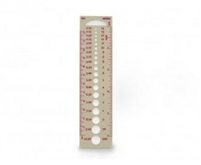 Handy little tool that's perfect for checking the size of needles with sizes in both imperial and metric and for measuring tension squares against its 12cm/5inch ruler. Comes in own plastic pouch. Choose from 15cm long plastic crochet hooks from 12.00mm and 15.00mm With a colour range of over 40 shades Robin double knitting is the premier 100% quality acrylic range. The colour palette also includes timeless classics, a colourful marl collection as well as the latest fashion colours. Robin Aran is a top quality wool blend Aran, With a mid market price tag. With a colour range of classic colours, Robin Aran will knit to all standard Aran designs.